New York-based artist Josette Urso returns home to Tampa Bay, fall of 2017, with an assemblage of her newest works: dense, warm, romantic, evocative paintings that offer a view of a landscape that appears to fully unfold the more time spent with each painting. 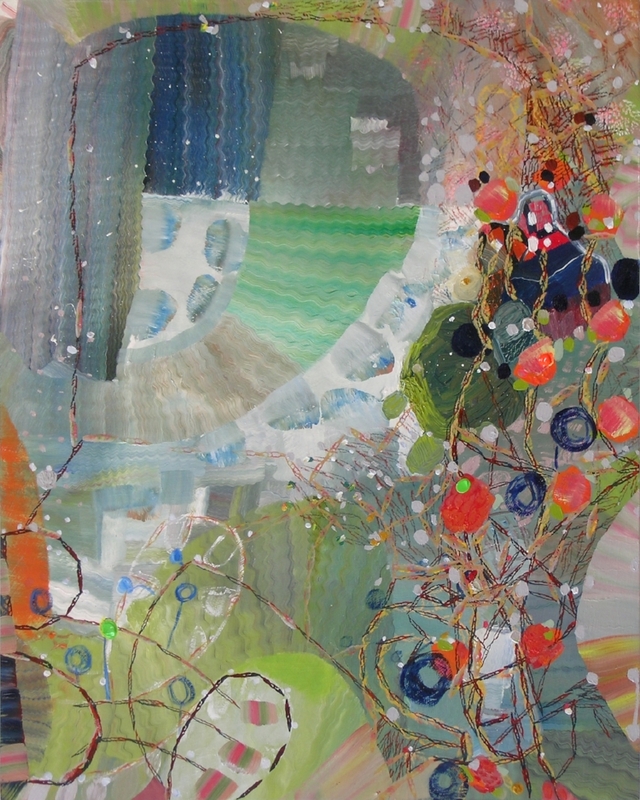 Well placed at the Morean Arts Center in St. Petersburg, Urso’s paintings showcase her self-stated approach to painting involving “ ‘moment-to-moment’ extrapolation where the contrasts and cross-fertilizations are cumulative, non-linear, free flowing and interpretive.” Urso’s landscapes are not representative but contain recognizable forms and shapes. The paintings capture a state of in-between with the viewer and the artist’s physical environment. Her titles -Sky Walk, Beach Day, Amber Sea - allow the viewer to evoke their own connection with a favorite painting. Urso still considers Tampa home after being raised and educated there through graduate school, but resides in New York, and travels frequently creating new works. Her artwork is full of energy and movement, much like the artist herself. Urso is a full-time artist, and prepares her environment to maximize creativity. Her studio design allows her to bring the outside in for inspiration; she keeps a collage at the ready for work, on a day when interruptions are too frequent for painting. Urso is committed to her craft, presenting a full palette of color and rich artwork in each show I have had the privilege to view. St. Petersburg Museum of Fine Arts curator Robin O’Dell labeled the work unexpected when we were together in New York, and the term still fits for these new paintings. The Morean exhibition paintings are smaller in scale, allowing for easy shipping and a full gallery of artwork. I noticed lighter more whimsical elements than I observed in a more rushed viewing in NY - more of the unexpected. Just enjoy Boo, pictured below, and its light hearted imagery. Urso has a demanding, one might say, enviable exhibition schedule. A hurricane - delayed opening featuring her paintings in St. Petersburg, Florida will be quickly followed by an opening of her watercolors in Germany, and another exhibition scheduled for January of 2018 in New York. JC: I understand you have an amazing studio. Has it changed your work? JU: I live beyond Williamsburg on the L train, and have been out here for about ten years. I love everything about being here. The studio has had a huge impact on my work. I have walls of windows so the outside really comes in. Where I live is up on a hill, so the city swoops down; it is kind of big sky country. It is the experience of being out in the weather and in the city when I am inside. Being in here when things are happening outside is pretty amazing. Everything about the scale of the windows has really influenced the scale of my paintings. When I was in my studio in Chelsea, I usually worked with my collages. I always work on several projects simultaneously and I did make some paintings based on invention. At the very tail end of my stay in Chelsea, I began to venture up to the roof and start some landscape paintings by responding to my immediate environment. Moving here, all of the sudden, everything about the thrust of what I was doing in the city changed. I was just very compelled to start working with my immediate surroundings. JC: I notice there are repetitive forms in this work, basketweave for example. Is there a particular impulse or meaning behind any forms? JU: I think it was just what came up in that moment, perhaps there were some wire sculptures hanging in my windows. These are very dense paintings, they are more textile in a way. JC: Is the work at the Morean Art Center a series, a full body of work? JU: A chunk of these (Morean) paintings were (painted) back to back to back. I don’t think in terms of series, more sort of an ongoing series. I am working on paintings for a show in January. I am sure aspects of what I am thinking about now will feed into the next painting; I don’t let anything completely go. When I travel to the country and have been in the city, I always bring a little of the city with me and when I return I bring a little of the country, there is always a flow. I am constantly working. There is usually kind of thread in the pieces; often they are influenced by time of year. I am constantly absorbing the colors around me. JC: You returned to Spain this year. Is this work the fruit from that time period? JU: it wasn’t. I finished these paintings prior to going. But Spain was really important; it was so interesting to go back this year. The first time I started working outside was in Spain. I arrived in ’93 or ’94 and my studio overlooked a wall. It was crazy to be inside when I was in this charming fishing village. I had been working on these small imaginary oil paintings at the time, and I thought the work would be a continuation of what I had been doing in the city but I was in a new place and working outside. I started to really absorb the place, the sounds in the harbor, the shapes of found cacti. Insects would walk across my paper and influence what I was doing. Everything about being outside started to work its way into my painting, just by chance, because I happened to be in that environment. My third trip there, in 2010, was when I reactivated my watercolor practice which is running parallel to my oil paintings. This summer in Spain, I worked on water color paintings outdoors. They are based very close to my oil paintings in terms of absorbing place, but not a picture of a place. I am more interested in the sensation of the overall place. I am more interested in chasing something down, discovering, working back and forth between observation and invention, representation and abstraction. JC: How does working outside differ from your studio? JU: In my studio I am looking out the window, but I am also painting indoors, so it is like indoor/outside. I am manipulating the near and the far. I hang things in the window, I make a lot of objects that I place around the studio, I have a lot of plants. So I am manipulating the space; I work very intuitively, my process is very exploratory and open ended. I can begin anywhere and end up anyplace. Even when I am painting outside. I am happy wherever I am plopped down; I am not one of these painters that agonize over what is the right place. Because I don’t know what I am going to find when I arrive, I guess I thrive on being as lost as possible during my process. I thrive on not knowing and looking for something. JC: I can’t take credit for stating your work as unexpected. Robin O’Dell, curator at the Museum of Fine Arts St. Petersburg, characterized it when we were in New York. I do strongly agree with that element of your paintings. Particularly after having viewed two exhibitions this year. JU: I think that is why I paint a lot when I travel. It shakes me up a lot to be in a new place. Looking for that unexpected or finding a way to surprise myself. It is really good for my work to see the world for the first time. I like a location that is punctuated by human activity, not really as much about being just in the landscape, but something happening in the landscape. For instance if I am sitting by the river, I am painting and chasing, chasing, chasing something all day, and maybe a red kayak passes through, all the sudden I find something. It is that something happening, that something unexpected that comes and introduces itself in a very unexpected way. I like it when I am chasing something that is moving, not a still quiet. The surprise element that you can’t predict is what I thrive on. And you have to figure out how to use it, if it is useable. JC: I really enjoyed the whimsical element in some of these paintings, the pumpkin and ghost? JU: Yes, that piece called Boo. It is all little objects that were in my studio. The little pumpkins; I like to put out little props. And that is humor, I am looking to surprise myself when I when working. I like to keep things wobbly and off kilter. I feel when the painting starts to make me laugh it is starting to become something. Looking for that surprise and wondering if I can get away with this has an energy and life to it. When that happened it was not something I would have ever predicted I would do, but it was just so right. It was something special. JC: When I was at your exhibition in New York earlier this year, the canvases were larger, perhaps a little more white space in the paintings. These are very dense, full of energy and exciting. JU: I am always working in different sizes. Partially the reason we decided to show smaller paintings was because of the shipping. To pack a large painting is very risky, I am always working in multiple sizes. Usually for a show I mix them up a little more, so I have small and large, but the larger paintings are getting harder and harder to ship because they have thick paint. JC: I am curious about this show title, Josette Urso: More Than Before. A mutual friend, Marilyn Mars, suggested it means you feel you still have more to do. JU: It represents my ever expanding love of painting. But yes, definitely more to do, I like that. Painting becomes more demanding as you continue with it. The more you know, that you don’t know yet, the more you are discovering. JC: Again, in the New York exhibition I visited, your drawings were part of the show. I was really attracted to them. You said at that time, drawing played a big part in your painting process. JU: I do make drawings along side the paintings. I don’t make drawings as preparatory sketches; but when I spend time drawing, I am much freer with painting. It gets me ready for the process of painting. Drawings require intense engagement with what I am looking at; it is pure engagement with the moment to moment experience. I especially love making them with ink, because ink cannot be erased. There is something important about spending time with that kind of intense time of engagement with the world. Drawing is seeing, seeing is knowing. I am more disciplined with drawing when I travel; I do it every morning (sometimes I do collage) and switch to painting in the afternoon. Maybe because I know if I am in Spain for two months it is such a finite period and you want to get the most out of that experience; the drawing helps me connect quickly to the place. JC: How does watercolor fit into your practice? Is it equally important? JU: Whenever I travel I work with watercolor. It is portable, I can take a lot of paper, it dries faster. The paint is so luscious, I can layer and layer. They are easy to bring home; it has become my travel medium. 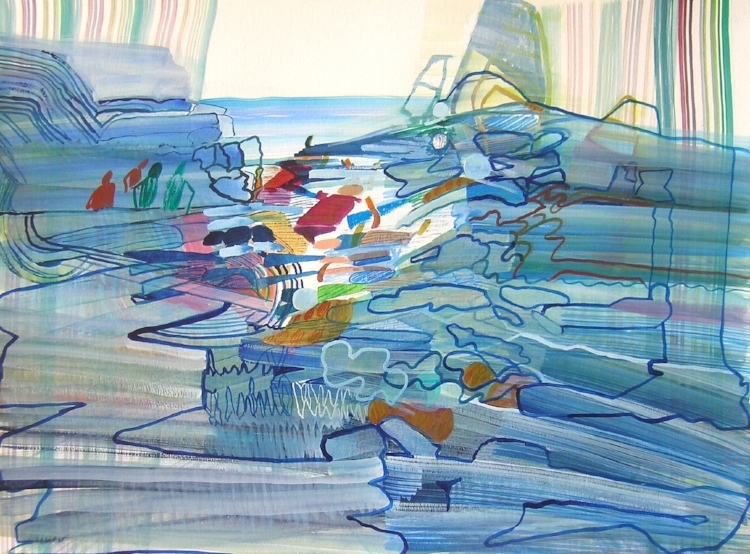 The thrust of getting back into watercolor was an invitation for a show in 2010, titled Painting Paper. I had always worked in watercolor, but they felt different, more like my drawings. They didn’t have the exploratory quality of my paintings, but now it has become more important. I have a watercolor show opening in Germany. I am toying with the idea of piecing papers together to make larger watercolors, somewhat similar to the way (Charles) Burchfield worked. But it has turned out for now, 12 x 13, was the perfect size. At some point I am going to start exploring larger watercolors. JC: I know you enjoy the dedicated time available for work in a residency. Have any residencies influenced your work in any particularly way? JU: This summer I had a residency in Steamboat Springs - a mono print residency with Oehme Graphics and a master printer. I made some watercolor mono prints that are larger in scale. That was very valuable. I feel like I had a very productive learning summer, valuable experiences that are feeding my work. JC: You are a full time artist, and have always had the opportunity to be an artist full time? JU: Yes, I do teach part time one night a week at Cooper Union. Occasionally I do a visiting artist job or a workshop, but the main thrust is being in my studio. I have a demanding exhibition schedule. As an artist you are very resourceful, there were many projects along the way, but always related to my work. It is like a gift, a wonderful gift. JC: I like your website design, very exploratory as is your art work. It gave me the sense you would prefer the viewer would discover your work for themselves. JU: Exactly! I hope the paintings unfold themselves. I find when I am making them, when I know less about them, and they really surprise me and when the painting is never quite settling, it is many different kinds of experiences. Then, it is the most interesting for me and I hope they do that for the viewer as well.